Our blog reader Mr.Nadim shared his valuable experience of "Converting UAE Driving License to Saudi Driving License" with us, And he want to share his experience with all our readers, So that it will be useful for the person who need it. - Two recent passport size photographs. 2. Get the driving license form from agent on the main entrance he will charge SR 4/-. 4. Then go to the main building and go to counter 6 and inform the police office in the counter that you want to change your UAE licence. He will stamp your file and ask you to go to other side counter 2. 6. In next 5-10 minutes they will announce your name and will handover the new Saudi driving license. 7. They will take your UAE license and no driving test required. Total cost for making 10 years Saudi Driving license from UAE driving license is = 400+150+4 = SR 554/-. 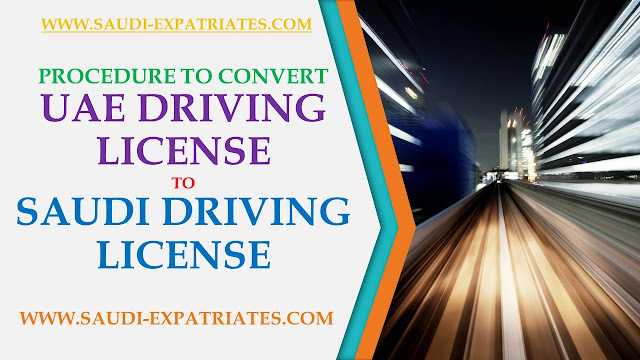 It is not advised to Convert the UAE Driving license to Saudi driving license in terms of money we spend. UAE Driving license must costly at least 10 to 25 times than Saudi Driving license, You just loose it while transfer, It is better to apply fresh Saudi driving license.